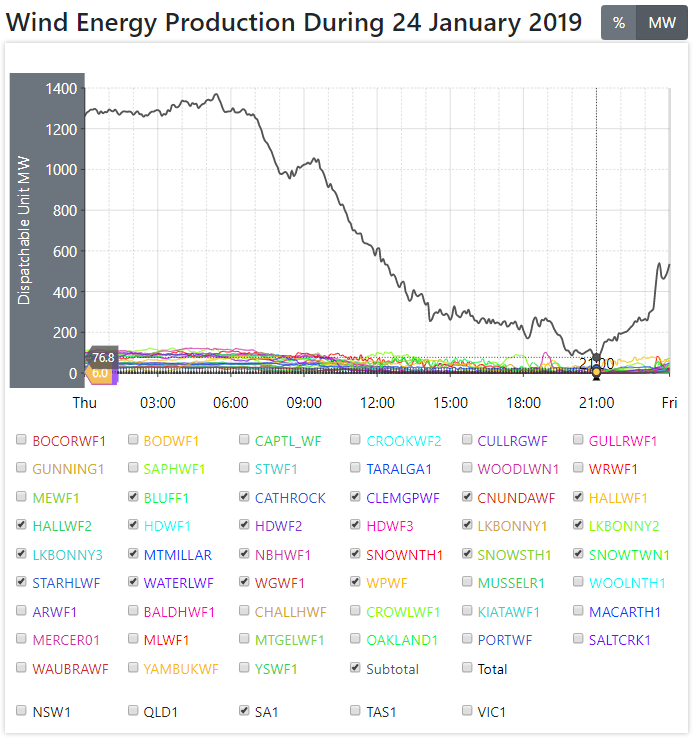 Wind and solar collapses in SA and VIC on 24 and 25 January sent power prices into orbit, as conventional generators cashed in on the chaos. As wind and solar power output hit the floor, the spot price of power hit $14,500 per MWh. The additional cost to power consumers was in excess of $1,100,000,000 – for the owners of fast-start peaking plants (OCGTs and diesel generators) – money for jam. For peaking power operators, the inevitable and total collapses in wind power output is where the greatest rort of all time begins. You see, it’s not really about the costs of running OCGTs (or diesel engined generators) this is all about what the operator can get away with. The pattern was set up by the energy market whizzkids from Enron – back in the days when it raped and pillaged the Californian power market, using much the same tactics. Wait for an “outage” – self-generated in Enron’s case – sit back and watch the grid manager panic about widespread blackouts; and then ‘offer’ to solve the problem by delivering power in the nick of time at rates 1000 times the average price: the Enron rort was detailed in the doco “The Smartest Guys in the Room”. In another fine dissection of the debacle, Alan Moran details the cost of Australia’s self-inflicted renewable energy calamity – what might well be called ‘Enron Rides Again’. Compared with a National Market that had a turnover of less than $7.5 billion a year four years ago, the turnover in just two days in January was over $1 billion. It is impossible without all data on contracts to determine who the electricity industry’s winners and losers were from the January 2019 high priced events. With the electricity there are multiple markets but it is best to think of them comprising just two markets. The first is the spot market which we see every five minutes; the price peaked in late January in some states at $14,500 dollars per megawatt hour (MWh). The price, prior to outcome from governmental destabilisation of the market, was $30-40 per MWh. The second is the contract market whereby sellers and buyers agree beforehand on the prices at which they will supply and demand electricity for all the various periods of time. This contract market really comprises probably 95% of the aggregate market and the prices are fixed in advance. In other words, for the vast bulk of electricity produced any given five minute period the prices are set well in advance but any extra production that can be eked out is very valuable. 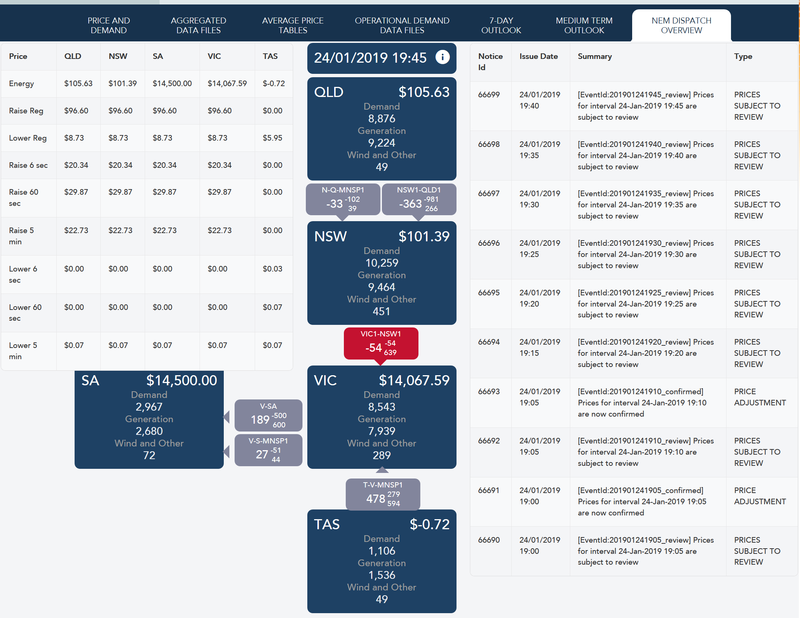 The price at $14,500 compares to the market price that used to average $38 four years ago and even with the effects of wind subsidies now evident still is only $90 per MWh. Contract prices are related to market prices, generally with a premium of about 10 per cent. That premium is likely to increase with a higher price volatility. Those making the gains from this month’s high priced events are generators that are less than fully contracted. The losers are retailers that are less than fully contracted. To the degree to which retailers are short, AEMO has disciplines that require cover in times of price stress and has not indicated that any retailers were at risk of non-performance. The blackouts would have helped in this regard. In terms of winners and losers, on the days concerned is likely that they were relatively small. Origin energy is short generation in Victoria but for that reason was likely to have been very highly contracted and its gas facility was operating strongly. Alinta owns the Loy Yang B plant which was previously fully contracted to the smelters but less so now and may have been able to make short term gains as a result. Both Snowy and Tas hydro were generating strongly and may have had some uncontracted supply in which case they would have made money on the days concerned. With regard to wind almost all of that capacity is fully contracted – it has to be in order for the wind generators to get bank financing. Banks abhor any suggestion of risk so the wind generators whether or not they were operating would not have made a great deal more money than they expected to make. Forced outages but it should be noted that these are less than under the general standard set by the market management. Above all the effect is a ramping up of the contract prices. These closely follow the spot price and as a result the contract market will continue the rise we have seen since the renewables destroyed the previous low cost reliable market, especially following the closure of Hazelwood. The Hazelwood closure was in March 2017 but was signalled in mid 2016 by the firm’s contract policy. 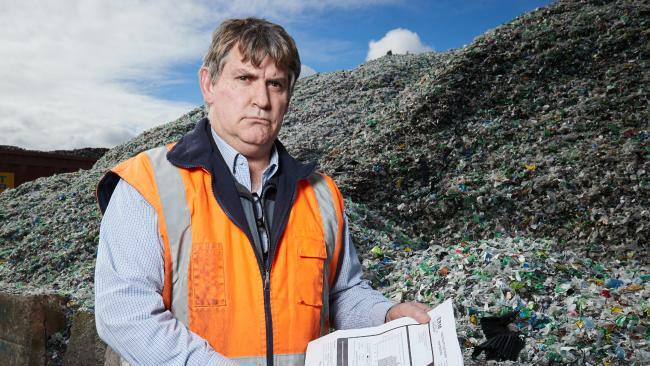 AGL ‘s profit from electricity generation was $2217 million in 2018. In 2015 with 10 per cent less output the profit was $426 million. The Vales Point plant was sold by the NSW government for just $1 millionon the advice of Kerry Schott, who presently heads the Energy Security Board, is now worth over $800 million. The losers are consumers, household and business. was an early casualty of the chaos. What can you do when this is going on? Vote against them. Educate your children and grandchildren. Wait for mass blackouts.